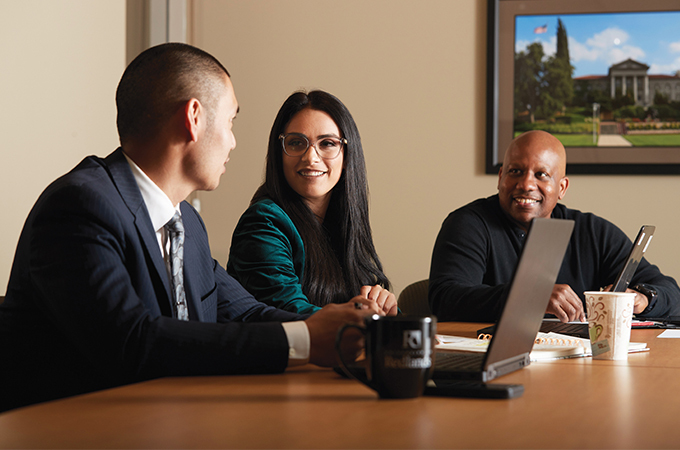 To identify and positively impact today’s leadership styles, skills, and approaches, the University of Redlands has launched the Purposeful Leadership Initiative. Integrating concepts and models from across disciplines—from management to ethics and philosophy to the social sciences—the new initiative includes educational offerings, research, and community outreach. A key element of the new initiative is the Master of Science in Organizational Leadership degree program (MSOL), which addresses the needs and challenges of 21st century organizational leaders. The MSOL highlights the importance of purposeful leadership and how it is implemented at the individual, group, organizational, and societal level. The Purposeful Leadership Initiative also includes a leadership speaker series, which debuts this fall with 5:30 p.m. talks by former Apple executive Jay Elliot (Thursday, October 25 at WeWork Aventine, La Jolla), Trust Factor author Paul Zak (Thursday, November 8, at WeWork Park Center, Costa Mesa), and Steve Kaufer, CEO of Trip Advisor (Thursday, November 15, WeWork Gas Tower, Los Angeles). Other projects and partnerships in development include an executive certificate program; research on leadership issues associated with the effective and ethical management of people and organizations; and the Leaders in Community Awards, which recognize effective and ethical leadership. The Purposeful Leadership Initiative, which builds on the 2006 endowment of the newly re-named Banta Center for Ethical and Purposeful Leadership at the University of Redlands, was made possible by generous new support from the Banta family of Redlands alumni, including David Banta ’63, ’65; Stephanie Banta ’63; Mark Banta ’89; and Kimberle Banta ’89. Other alumni have joined the Bantas in pledging support for the initiative as well.